You can use star sizing when setting the height of rows or width of columns in a Grid to distribute space in a Grid across multiple rows or columns. 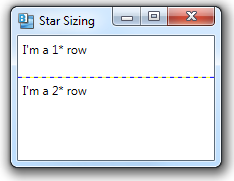 When you specify the size of a row or column with star sizing, you can specify the size simply as “*”, or you can specify a number followed by the star (e.g. 2*). 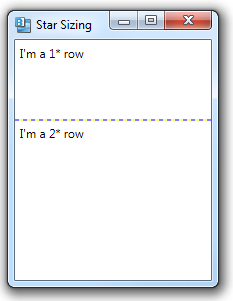 The number indicates the size of the row or column, relative to the other rows or columns. (The value “*” is equivalent to “1*”).